Framingham, Massachusetts - January 25, 2019 – Framingham Public Schools’ students from Walsh Middle School and Cameron Middle School VEX Robotics team 9791B, secured Tournament Champions and 5948A earned the Judges Award at the VEX Robotics Competition that took place in Framingham last weekend. Students competed with and against 23 teams from Billerica, Leominster, Lexington, Marlborough, Milton, and North Andover. The action-packed day required middle and high school students to execute the 2018-2019 VEX Robotics Competition game, Turning Point, which is played by stacking caps on posts, by flipping caps, by stacking balls on caps, by toggling flags by throwing balls, and by parking robots. As Tournament Champions recipients, the team 9791B has qualified for the Southern New England Middle School Regional Champions, extending their journey as they seek to qualify and compete in the VEX Robotics World Championship. WalshBots Brady Bunch VEX Robotics Competition team is comprised of 8th graders Brady Levensohn, Ryan McLoughlin, Molly O’Mara, and Paige Spodick. To prepare for the tournament, the group worked together to design, build and program a robot using VEX EDR, that could quickly and efficiently solve specific challenges that come with playing the 2018-2019 VEX Robotics Competition game, Turning Point. Each week, the students apply what they’ve learned about STEAM (Science, Technology, Engineering, Arts, and Math) in the classroom, to build the semi-autonomous machines. An equally important set of skills is learned through the competition -- communication, project management, time management and teamwork. Walsh Middle School VEX Robotics Competition teams meets after school at up to four times a week. The students learn about engineering design, electronics, programming, and mechanical systems. This is the third year the CamCats team 5948A has competed for Cameron Middle School. The team’s original participants are 8th graders Nilufar Noorian and Lena Ocain and, new to the team this year, is 6th grader Zeybek Tezduyar. Over the last two years the team has traveled to Walsh Middle School in the afternoon to work with the Walsh teams in Walsh’s Robotics Lab. This year they are working at Cameron in the newly formed Makerspace. Angie Goldberg, the CamCats’ advisor said, “Our experience working at Walsh has helped this team build the knowledge and confidence needed to work on their own. We are still able to draw on the resources and expertise of Walsh when needed and truly appreciate all the support from their club and also the club at FHS.” She went on to say how proud she is of her team and all the effort they have put forth to make it to this point. Teams from Milton Academy, Locke Middle School, 1st Lt Charles W. Whitcomb School, Cameron Middle School, and North Andover Middle School also participated in this past weekend’s event. While WalshBot’s Brady Bunch won the event overall with Locke Monsters, other teams also received awards. 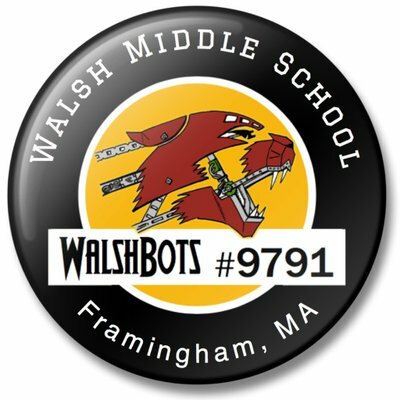 WalshBots will be competing in the upcoming Framingham Turningpoint VEX Robotics Competition qualifier on February 9th at Walsh Middle School. The event is open and free for media, families, and other community members to attend. The Framingham competition is one of a series of VEX Robotics Competitions taking place internationally throughout the year. VEX Competitions are recognized as the largest and fastest growing competitive robotics programs for elementary schools, middle schools, high schools and college aged students around the world. VEX Competitions represent over 20,000 teams from 45 countries that participate in more than 1,500 VEX Competition events worldwide. The competition season culminates each spring, with VEX Robotics World Championship, a highly-anticipated event that unites top qualifying teams from local, state, regional and international VEX Robotics Competitions to crown World Champions. More information about the VEX Robotics Competition is available at RoboticsEducation.org, RobotEvents.com and VEXRobotics.com. Nilufar Noorian - 8th grade and Zeybek Tezduyar - 6th grade (missing Lena Ocain - 8th grade) from Cameron’s 5948A team won the Judge’s Award for the perseverance and effort they have shown in their VEX Robotics participation.